This week’s post is all about those pesky Mandarin Chinese tones. This is the first half, the basics as it were, and next week’s article will be about how to master tones at higher level of thought. 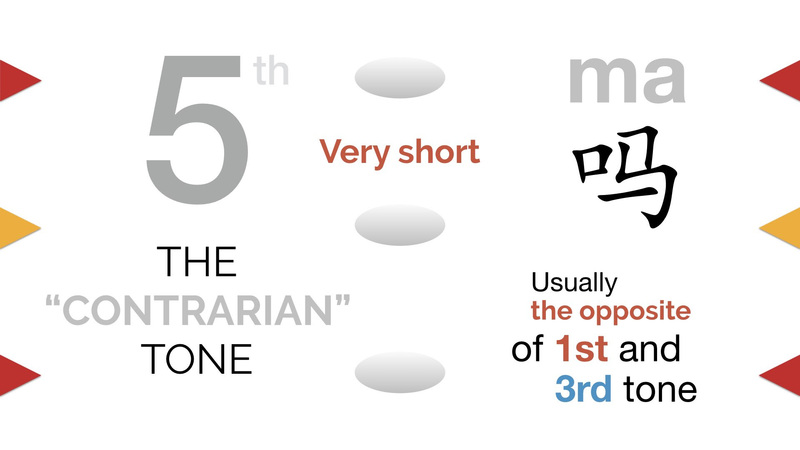 The first thing that everybody tends to get wide-eyed about when it come to learning Mandarin is that it is a tonal language. Does it mean I have to sing? Does it mean I may be incapable of mastering Chinese tones if I am not a natural? 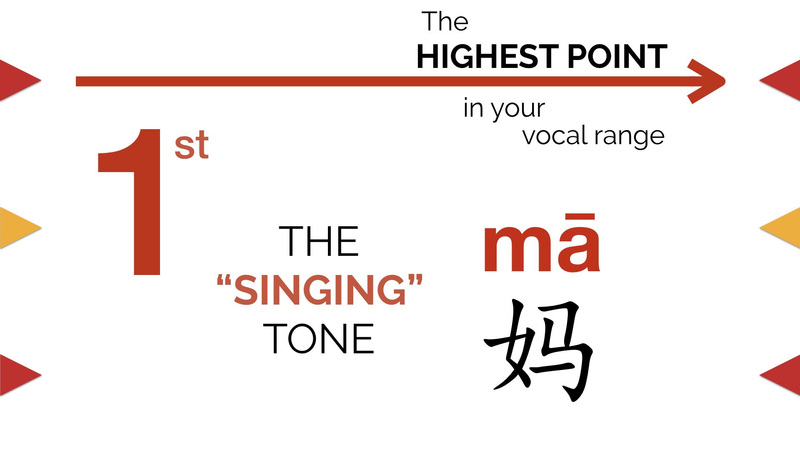 How long does it take to master Mandarin Chinese tones? Reasonable questions, but the first thing we’d like to you to recognize is that you already use tones to express meaning all the time. The difference is just the layer of the language in which the majority of the meaning is expressed through tones. How to English Tones & Chinese Tones Compare? In English, we use tones on the layer of the sentence, but in Chinese they use tones on the layers of the character & the word (and the sentence as well, but not nearly as often or consistently as the character and word). This IS psychologically tricky. What it means is that you can’t just improvise with words to try to change the meaning on the sentence level. But that’s just it, its psychologically tricky, not impossible. You already use tones, so if you have that “I just can’t do it because I’m not musical/don’t have a knack for it” idea in your head, get rid of it immediately, because it’s actually wrong. You use tones all the time. The above video is the highlight reel from this week’s Facebook & YouTube livestream that we do every week on Monday’s at 2 PM China time (sorry US & European folks, but hey, we live in China!). We address several of the issues that people have with starting to learn tones in this video. All Chinese tones exist in English. 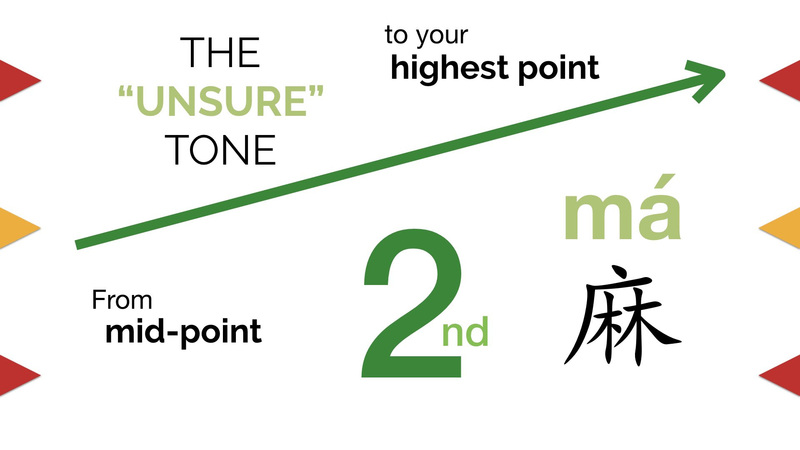 It’s just that we use tones in English for intonation and tones in Chinese for meaning. A wrong Chinese tone is not an accent, it’s just wrong. Be determined from the start to get it right. Relax and don’t fret too much. Muscles need time to grow. We call this the “singing” tone because it sounds like a high pitched “laaa”. Is a flat tone at a pitch that is at the top of your range, but comfortable to produce. Do it as if you’re singing, but you don’t need to sing soprano! It is the longest and loudest tone, which is why it is the default tone teachers use when training you on new sounds. Other equivalent English sounds would be the high-pitched “uuuhhh” tone we produce when thinking about something, or the surprised high-pitched “whaaaat?” we say when we hear some shocking news. We call this the “unsure” tone because it’s essentially the rising tone we make at the end of a yes/no question e.g. are you sure? Start from your normal speaking voice (i.e. mid-range) and move upwards sharply to 1st tone level. It’s short and sweet. 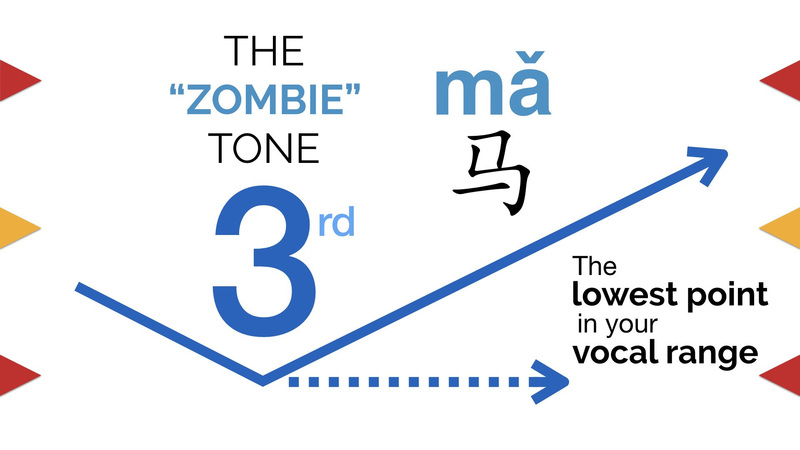 We call this the “zombie” tone because in the vast majority of cases it’s pronounced like a zombie saying “brains”. Short, low and croaky. Only when emphasizing a word or saying a character individually is the 3rd tone pronounced like larger arrow in the graph above with a falling and then rising pitch. 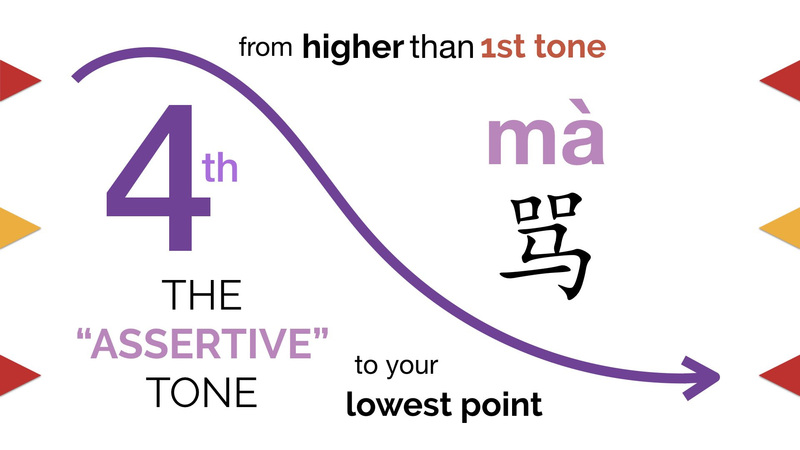 If you always pronounce the 3rd tone fully down and then up it’ll sound like a 2nd tone to native speakers. Just keep it low! We call this the “assertive” tone because it sounds like saying “no!” to a misbehaving dog. It begins a little higher than first tone and looks more like a curved falling arch, as opposed to an angry tone straight down, more graceful. Make sure to make your 4th tone fall all the way down to 3rd tone level. We call this the “contrarian” tone, because it tends to be the opposite of 1st and 3rd tone. So if the previous tone is high (1st) the 5th tone will be low and vice versa. This one is really easier if you don’t try to pronounce it, just let it fall out of your mouth. We also toyed around with another name for this tone: the “Italian” tone. Why? well because it reminded us of the “ti” sound on the end of the word “venti” (that’s a coffee size at Starbucks meaning “twenty” ounces). That ti sound is just what we want your 5th tone to do most of the time, just kind of fall out of your mouth with no effort. When you ask a teacher about how to pronounce a specific character, they will probably over-emphasize pronunciation, making it sound different from real life. Ask your tutor to us the tones in a sentence for more natural results.